You can blow money on stylish clothes and spend countless hours at the gym, but if you don't get your dirty goblin teeth sparkling, you'll be the only one seeing your naked body. 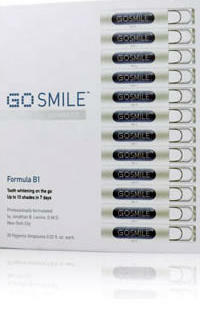 De-gunk those chomps with GoSMILE. This take-home dental wonder kit will transform even the most simian-looking munchers into radiant mouth diamonds. The process is so simple, actual monkeys could quickly master it: just squeeze a capsule to activate, then brush the formula right onto your teeth. GS attaches to your enamel just long enough for restoration, but it won't lead to pigment depletion -- a horrid condition that leaves your teeth opaque blue, as if you've been bobbing for urinal cakes. It'll only take a week for the system to work, and will be well worth it once you're flashing your new gleamers. Don't worry if coffee once again takes it toll because maintenance refills are also available for you to re-eliminate the creeping brown menace. You could put this off, but remember: a vicuna suit and engorged lats still can't compensate for a wretched grin.